On a good day and in great shape, I can run a 10-mile race at about a 7:00 pace and run a 5:00 pace for about a half-mile. So what business do I have running 15 minutes alternating between a 7:00 pace for two minutes and one minute intervals between 6:00 and 5:00 pace– especially when I’m just coming off an injury? 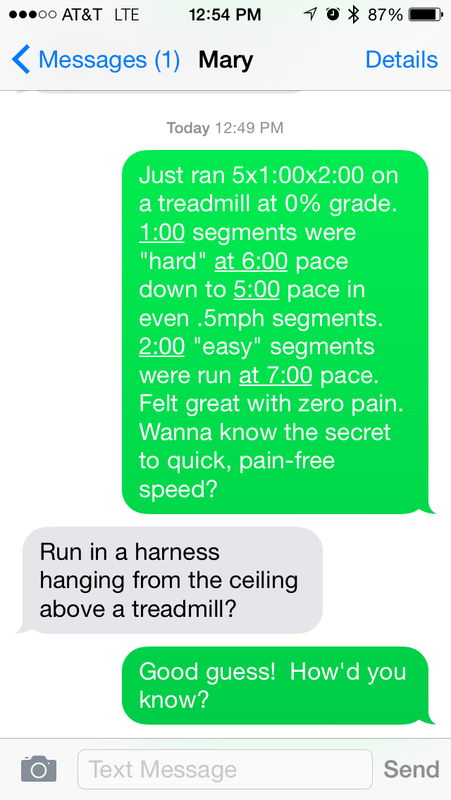 The simple answer, of course, is running on an Alter-G treadmill at 75% gravity. This is my second workout since starting back on running after my recent autologous blood injection. On my last run, I ran at 70% gravity and, after running leisurely at a 7:30 pace, I kicked it up for a mile at 6:00 pace. This would have been really hard if I did it outside, but with the reduced gravity, it was more a test of leg speed than running ability. As I described in my last post, I’m using next-morning-pain, to guide me in whether I pushed too hard. I woke up the next day without even the slightest bit of pain in my plantar fascia so I knew I was good for a little more of a challenge this time around. So instead of running at 70% gravity, I ran this time at 75%– and it felt great. Running fast obviously means includes fighting gravity and it’s a lot easier to run when some of that is taken out the equation– as it is with an Alter-G. But there’s another component to running and that is simply moving your feet and legs backwards and forwards with enough velocity to keep up with the treadmill. Hamstring and calf soreness is generally related to the eccentric phase of running, which are directly related to running speed. For instance, while the hamstrings are critical to providing the “push” to movement your leg backwards in the running stance phase, that’s not where hamstring soreness comes from. Instead, it comes from the end of the flight phase as your hamstrings try to slow down your lifted leg as it moves forward under your body. Eccentric contraction like these are brutal on your body– and they are key limiters to running performance. So I’m happy to take the abuse on an Alter-G so I can become a much faster runner when I get back on the road. 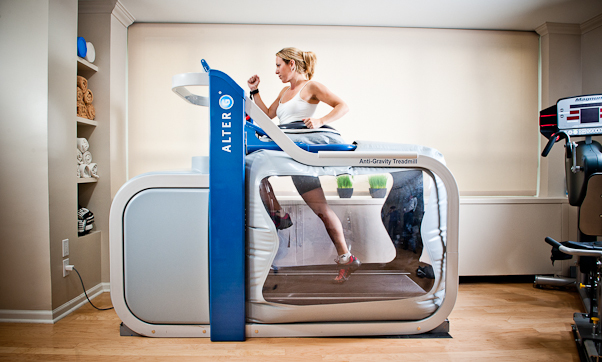 I can see myself using the Alter-G a lot more this year as I get ready for some of my races. Another nice aspect of this morning after pain in my case was that my quads were relatively pain-free. Quads are also susceptible to DOMS pain, which typically comes after running downhill as the body tries to brake against the extra pulling forces of gravity. With an Alter-G treadmill, your body is relative fixed fore-to-aft by the balloon that encloses the treadmill so it’s natural to assume that, with fast workouts, it would pull you forward just like gravity. But my lack of quad soreness suggests that I wasn’t braking too much, which means that I wasn’t going too fast. But back to rehab. After spending two weeks doing essentially nothing, I started cycling again. It’s amazing how fitness just seems to drain out of the body while I was laid up. For my first week back, I rode about four times in a week. This week, I started on the Alter-G and I’ll do four runs on the Alter-G and bike rides on every day I’m not running (plus one day of running and cycling). Next week, I’ll plan to run three times on the Alter-G and try to ride the bike most days as well (including one long day with the class). On my non-Alter-G days, I’ll run outside for maybe a mile or two. The next week, I’ll follow the same pattern, but increase my outdoor running distance to maybe three or four miles and hit the Alter-G twice. The week after that, the same pattern, but get up to 5-6 miles outdoors and once on the the Alter-G. After that, just keep building the outdoor mileage and now keep at least one day a week on the Alter-G. I can see it being amazing for doing serious “overspeed” work for maxVO2 intervals and above– exactly the kind of speedwork I need on my new heavily polarized training plan.